Discussion in 'General Chat' started by LivingCorpse, Feb 11, 2019. ...That also includes humans right? Uh so... Considering what I said earlier, does it mean that I actually... might I actually accidentally ate somebody's ancestors? ...of course it is all just an example of course. I think you should be more worried about contracting a disease that your immune system can't handle. Since pre-historic bacteria can be more vicious than modern. Well if you're living in a predestination paradox it's fine: The fish you ate was never anyone's ancestor because it was always eaten by you in the past. You not being there to eat it would be the problem. Wwll, those are interesting theory ...so I might just doomed some alternate earth history but not mine? Phew... So, how do I get back? Just go back in time again and slap your past before you catch the fish. Um, maybe that will do the trick? Just try not to go too far back or do something too major. Sorry but no killing Hitler before WW2. It's been working out fine for me. What if you went back to before world war 2 and rather than killing Hitler you just pulled millions of Jews out of said countries. For example, become a big figure in some African country. Make the country prosperous. Then help most Jewish people out of future german controlled countries. Thereby making sure the technologies we made because of WW2 happened while drastically lowering the amount of people who died in concentration camps. I mean thats assuming that family line survived till the point of evolving into humans and then survived to the modern age, if you are only worried that Brian from accounting doesnt exist anymore because you got peckish. But other than that, yeah, i doubt it. I'm pretty not many family lines can be traced that far back just due to them not surviving the ages. Theorem 1: Everything can be used for good or bad. Good: me travelling back in time and making money. Bad: an animal lover travelling back in time and saving an dinosaurs/dragons. You know cannibals prefers to be hidden and do their business in secret not reveal themselves in such scientific and sophisticated way, you know? All you have to do to stop world war 2 is to prevent world war 1. World war 1 cause the German resentment of the unfair treaty thus the nazi gain control .It also weaken the Russian empire thus allowing the Bolsheviks in gaining control. Hypothetically, that is indeed the case. 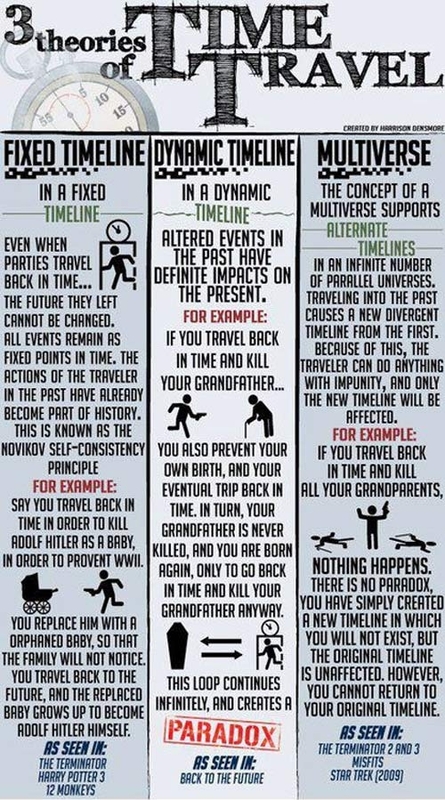 But time travel theories have no actual proofs. There is a possibility that what you ate would have died without making an offspring or making a major change. Meaning that it was possibly a meaningless existence. Then there is another possibility, or theory, that the laws of the world will try to fix itself, so that thing that you ate which was supposed to be the ancestor of some guy might no longer be his ancestor, but the ancestor became something else. In any case, no point talking about this since it would all only be theory. How do you pull millions of Jews out of Germany? Also I think a lot of the African countries were owned by European powers. You might stop the war just by doing that. Besides the main point of not killing Hitler is to let people see how disastrous his ideas are and where they lead. He made genocide, antisemitism, colonialism, and racism in general unpopular. I've always liked the first the most. Heard about it from the Artemis Fowl books. Killing Hitler prior to World War II would not necessarily have prevented the tragedies that occurred. Hitler rose to power in a country with an economy that was dying from World War I. Anti-Semitic sentiments had already existed in Germany even before Hitler rose to power. The people needed someone to blame for their problems, and that someone ended up being the Jewish people. Through his conquests, Hitler was able to bring some prosperity back to Germany, which is why he was popular. If there was no Hitler, some other anti-Semitic leader could have risen in the political climate of Germany at the time. Perhaps that person would be worse, or perhaps they would be better. There is no way to know indefinitely. Preventing World War I (by preventing the murder of Archduke Ferdinand) would be more likely to prevent the tragedies of World War II. Not a guaranteed method. Seems like an interesting idea. However, you would need to convince the Jewish people to leave their homes. How exactly are you going to convince those people to leave their homes? Perhaps, by the time that they realize that the German-controlled countries are dangerous, people have already been sent to concentration camps, and people have already died in them. Africa is quite a distance from Europe, and not all the Jewish families are going to either have the ability to go or have the desire to go. If you are forcing them to relocate to Africa, and they do not understand the dangers of Germany, they will think of you as a tyrant and resist you. I think your idea needs some more thought put into it because I don't quite see it succeeding. tuna?is there any tuna in that time? I think I need to go see a doctor. userunfriendly A Wild Userunfriendly Appears! I prefer that short story by Larry Niven about a civilization that used hyper large rotating masses to generate a retrograde time travel device, that doesn’t break Relativity...and the universe edits out the causality paradox by making the sun go nova just before the machine is turned on. No discussions about multiple worlds theory. Nice and simple...paradoxes are impossible outside of fiction. You're rolling the dice at that point. Antisemitism has been floating around Europe for ages. There have been atrocities against them way before Hitler. I actually think a lot of the Jews in Germany had fled there from the Russian Empire. Hitler's the one that made it unpopular though. The German people didn't need to blame someone for their problems. At any rate I don't think you can find someone as charismatic and evil as Hitler so easily.